(Francisco Kjolseth | The Salt Lake Tribune) People enjoy a blue bird day at Solitude Mountain Resort following a series of storms that have piled on the inches of snow in the high country on Thursday, Feb. 7, 2019. A series of winter storms — with the latest dusting much of Utah this weekend — has piled up more snow than the state has seen in years and even more is expected this week. It’s a bounty for conservationists who say the above-average snowpack will mean a good water year. It’s a concern for meteorologists who worry about the risk for avalanches and say the number of fatalities is already higher than normal. So far this year, over a period of less than four weeks, four people have died in avalanches in the state. That includes a snowmobiler who was killed Saturday east of Coalville in the Uinta Mountains. Two days before that, a 41-year-old man was trapped under a slide and died on Circleville Mountain in Beaver County. 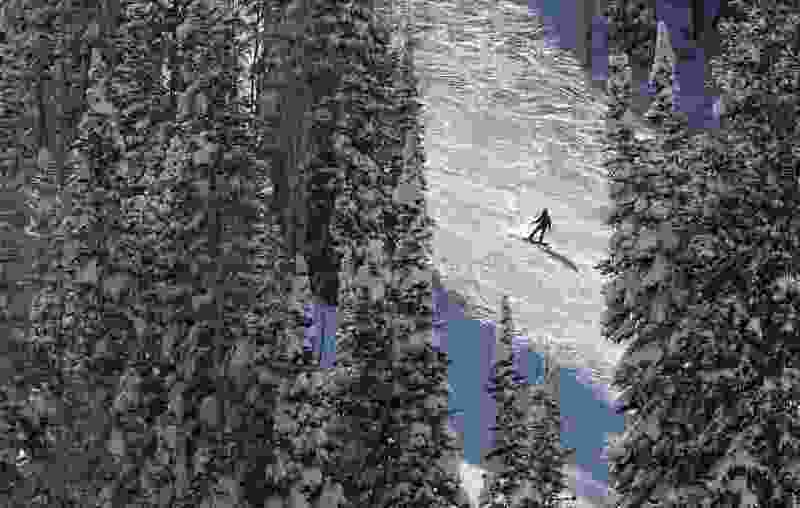 Typically in Utah, an average of four people die in avalanches over an entire year. “We’ve already matched that,” Gordon said. And most of the state, he added, is currently ranked “considerable” for the risk of more after the new snowfall this weekend. The first major storm of the year came Wednesday, dropping more than a foot of powder in some parts of Salt Lake Valley, closing canyons statewide and prompting a rare snow day for schools along the Wasatch Front. It was followed Sunday night and early Monday morning by several more inches that fell on top of that. With the latest flurry, Utah’s snowpack is now 126 percent of the average for the state, said Eric Millis, director the Utah Division of Water Resources. Last year at this time, he told Utah lawmakers Monday, most maps had the state in red and yellow categories for poor conditions and likely droughts. Some of the ski and snowboard resorts, including Alta, saw more than a foot of snow with Sunday’s storm. And Big and Little Cottonwood canyons put in place restrictions early Monday morning, temporarily requiring people to stay inside for safety. Brian Brown, spokesman for Snowbird, said, year to date, the resort has seen 384 inches of powder. Usually, by the beginning of April, when the season ends, it’s at 500 inches — so Snowbird is well above normal and expects a stormy February and March, too. “It’s really shaping up to be a pretty good season so far,” he said. Millis added that “we need the storms to keep coming” to build up the water supply more. It won’t guarantee there won’t be a drought this summer — and much of the state is still categorized as being in “moderate drought” conditions by the United States Drought Monitor — but it will help. Just last month, the state was at 92 percent of the average; the two big February storms have pushed that up significantly. Early totals from the weekend storm also include about 3 inches for most of Salt Lake City and more than half a foot in Sandy and West Jordan, slowing Monday morning commutes and frustrating homeowners with long driveways. 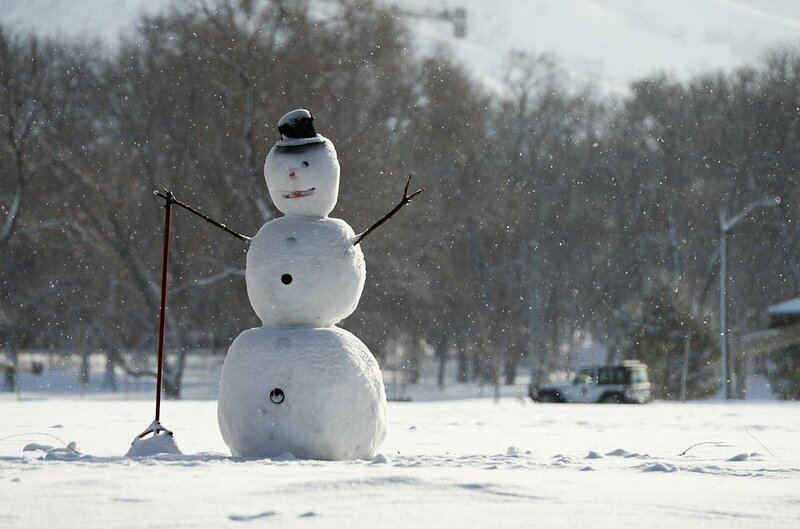 (Francisco Kjolseth | The Salt Lake Tribune) A frosty snowman greets passersby from the edge of Fairmont Park in Salt Lake City as crews clear sidewalks and roadways after another storm dropped a few inches in the valley on Monday, Feb. 11, 2019. It’s the most accumulation the state has seen in maybe seven or eight years. And the National Weather Service predicts more snow to come, too. The storm cycle will push on late Wednesday and early Thursday. It’s unclear if the valleys will see rain or snow or a mix of both, but there will definitely be more snow in the canyons, said Salt Lake City meteorologist Steve Rogowski. There could also be an additional snowstorm this weekend with temperatures along the Wasatch Front hovering in the 30s. Gordon with the Utah Avalanche Center added that if the snow stays cold and dry it will help stabilize the pack and make it less dangerous for skiers, snowboarders and snowmobilers. Right now, the top layers are wet and heavy, sitting on a light powder at the bottom. That has created the dangerous setup for avalanches where, in some cases, the season’s entire snowpack has collapsed, including during Saturday’s fatal slide. Jason Lyman, 49, was killed Saturday in a slide that spanned several football fields and went nearly 6 feet deep. Video of the area taken by the center afterward showed trees toppled and huge drifts of snow pooled at the bottom of a slope. The friend couldn’t find his probe when he was packing for the day, so he didn’t bring one. He told the center Sunday he wishes he had. Still, he was able to help unbury Lyman, and now he’s encouraging anyone out in the snow to bring a beacon, shovel and probe and to watch the avalanche advisories.